There I was on a warm summer day in Anchorage, Alaska, hammer in hand, pounding away on the vitals of a race car's engine. Now before you think they should arrest me, lock me up and throw away the key, I should explain that I was only 5 years old. Back in about 1952, my dad, Ray Dougherty, was a mechanic for a man who raced a 1940s modified stock car on an oval dirt track located way out on the Seward highway. My dad kept the race car in the yard next to our log home on Fairbanks street in Anchorage. One Saturday my dad was working on the race car's engine. Before he was finished with the car, he went to get something at the store and left the hood of the car up and a small box of tools next to the left front tire. It occurred to my 5 year old brain that I could help my dad by "working" on the race car's engine. I opened the tool box and spotted a small hammer. Just the right size for a 5 year old mechanic guy. Moments later I was standing on a bench in front of the car with my head under the hood. I looked over the engine for things to "fix" and when I found them, I gave the part a whack with the hammer. As I stood there pounding away at the race car's vital organs, my dad returned from the store and saw what I was doing. I proudly told him that I was helping him "fix" the engine. My dad responded by telling me in no uncertain terms that the race car was off limits and that if I aspired to be a mechanic, I was to let him know first. Fortunately for me, I had not broken anything while "fixing" the engine with a hammer. 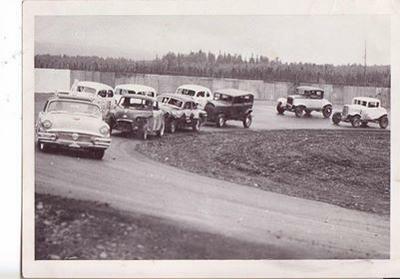 Every Sunday our family would head on down the Seward highway for a day at the race track. I always thought it was cool that while me, mom, my sister Anna and little brother Tom sat in the grandstands, my dad was down there in the pit area in the middle of the track. One Sunday, they had a mechanic's race and my dad agreed to be the driver for his car. My sister and brother and I were excited and proud, but our mom, Louise Dougherty, was very nervous. As the cars drove a lap around the track and the flagman jumped into the air waving the green flag, all the cars started speeding down the track with a thunderous roar and it was so exciting. There was our dad, racing like the wind down that old dirt track. But about the 3rd or 4th lap, dad was in a collision as he went into the second turn and he ended up skidding off the track, crashing through the wooden fence and disappearing on the other side. Was dad OK? Would they need to use the stand-by ambulance to transport him to the hospital? As we all sat there for what seemed like forever, watching our mom about to jump out of her skin, someone by the fence gave the sign that our dad was alright. Later, dad made his way up into the grandstands. He was walking with a limp as he made his way to us. Mom gave dad a big hug and then said, "Ray Dougherty, no more of that. You can fix the car, but no more racing." Dad agreed. All these years later I can still see my dad roaring down the track in that race car, the collision and his car skidding off the track and crashing through the fence. Some years later, the Alaska Speedway, a paved, oval track opened up on Debarr and Bragaw. 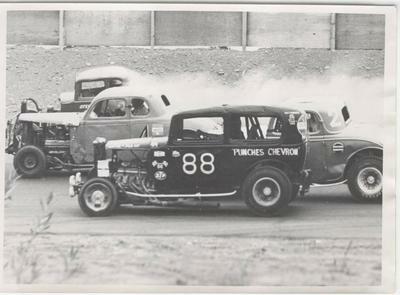 Our family used to enjoy watching the races at that track, and our dad knew some of the mechanics and drivers. I remember Don Howell, Blackie Keister, David Fuzzy Sprinkle and dad's good friend Hank Langman. When I was in my teens, Hank langman built a race car and asked me, my brother Tom and our good friend Paul Stoner if we wanted to be part of his pit crew. Well none of us knew beans about cars, but the idea of being part of Hank's pit crew was incredibly exciting. We would get to wear our own white pit crew overalls and would look ultra cool for the girls whenever we walked from the pits into the grandstands. On our first day in Hank's garage, Hank stationed us near his race car and gave my brother Tom a fire extinguisher. Hank then started up the engine for the very first time and huge blue flames flew out of the exhaust pipes as the engine roared like a monster. My brother Tom got scared, pulled the trigger and shot me in the left leg with the fire extinguisher causing me to nearly jump out of my brand new white pit crew overalls. The first Sunday that Hank raced the new car, me, Tom and Paul mostly handed him the tools Hank asked for as he went about prepping the car for it's first race. When it was race time, we all watched intently as our race car went through it's paces with Hank ending up somewhere in the last third of the cars. At the end of the race, Hank pulled the car into the pits and said he needed to adjust the suspension. While were were all concentrating on our race car, another race was going strong. Suddenly a car went out of control on the track and came skidding into the pits, throwing gravel everywhere. Tom and I and Paul yelled at Hank that a car was about to crash into us. Hank came out from under the car while Tom and I and Paul took off running for our lives. Someone across the track had a camera and took the perfect picture at just the right time. There was the car crashing into the pits, dirt and gravel flying high into the air, and there was Hank watching. As for me, Tom and Paul, we were caught by the camera in mid-flight at a dead run, getting as far away as our legs would carry us. At the end of that racing season, my brother and I and our friend Paul decided to hang up our nifty white pit crew overalls for good. I'll never forget the many Sunday's we spent at those two race tracks. And today it's fun to tell people that I was once a member of an Anchorage, Alaska pit crew for a race car - even though I didn't know beans about cars. Hey, my wife just told me that our car needs some work. Does anybody have a small hammer I can borrow? Check out this fun story, "Winter Time at an Anchorage Drive-In Theater" right now. My family was transferred to Elmendorf in the late spring of 1965. My father discovered the speedway and every Sunday took me and my brother to watch the races. I remember, I was only 15, Don Howell in the 5 car, the 88, Fuzzy and the flagman Blacky. I was there when Blacky got run over by the 5 car when the right front spindle broke. That was a sad day. That accident took the starch out of watching the races for awhile. 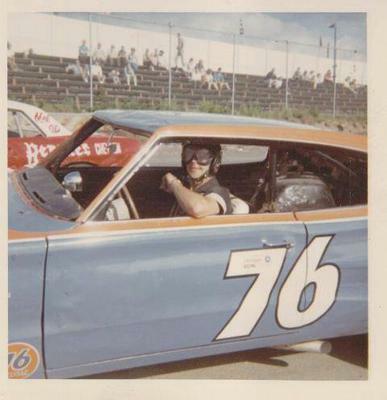 However, I am 68 now and I think back to the good times at the car races. Both my Dad and Brother are gone now but boy those were the days. I love your Anchorage Race Track Memories story! My dad was a cabinet-maker/carpenter who was always building things for other families, and sometimes for us, as well (grin). I remember my brother Frank "helping" Daddy with his smaller versions of the same tools, also. He was very carefully supervised, but even then there were a few "fixed" things that got him into trouble. Later, though, he because a very good carpenter and craftsman, himself. He specialized in using mini-lathes, most of which he built himself. Unfortunately, both Daddy Frank and Frankie Jay are now gone from us, but those memories always warm my heart.